This month's Common-Thread Give-Away Artist is Maria Wulf. Most who have frequented my blog know Maria Wulf and her husband, Jon Katz. Both are "the hub" of our Common-Thread Art Group. We are all bloggers and artists, that have banded together to support each other on line and all of our websites can be accessed on the right hand side of my blog simply by clicking on them. I have done many blogs about Maria and never tire of telling others of the various things I know about her. She never fails to amaze me!! She knows that I both admire her work as well as her life. She is a "hardy farm woman" which is a great compliment to her. Few have the courage, grit and determination that hallmarks Maria's character. She is a very strong person, in every sense of the word. 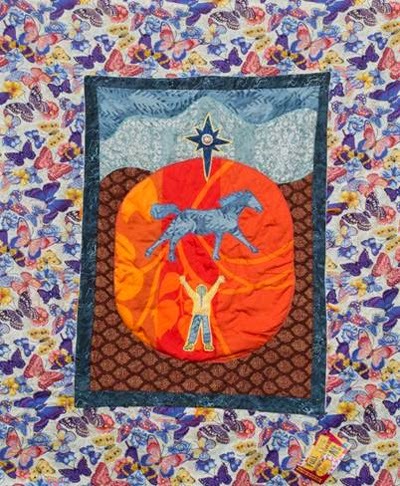 Despite weathering some difficult events this last year, as her husband's urgent heart surgery, the loss of her beloved dog, Freida, as well as Simon, their cherished donkey, and Lenore, Jon's sweet black lab, Maria continues to make her Gee-Bend style quilts, special one-of-a-kind quilted potholders and her "free-streaming quilted art" as well as her creative sketches. All her work tells the story of what goes on in her busy life and complex mind. Her writings reveal even more. Maria's love of animals is manifested in this 50" by 60" fleece blanket that she is giving away to the lucky winner of this month's Common-Thread drawing. It is the replica of the banner she made for Blue Star Equiculture, The Working Horse Sanctuary. She has described it as a symbol of the ancient bond between people and horses and the importance of keeping that relationship alive. The proceeds of the sales of these "Restore-the-Bond" blankets were given to support the horses at the Blue Star Sanctuary and horses around the country, and this month the lucky winner of the Common-Thread Give-Away Drawing will receive one of these special blankets! All you need to do to register for this drawing is to go to her website at Full Moon Fiber Arts and leave a comment for her anytime Monday through Wednesday and the winner will be announced at the end of this week! There is nothing better than a fleece blanket to keep you warm in these final weeks of winter, and this is one that will warm your heart as well. Our monthly free Common-Thread Give-Away drawings are our way of saying, "thank you" to our readers. We appreciate you frequenting our websites and exploring our special hand-made artwork. Register now and do stop and see what she still has available on her Art for Sale Page or simply browse through her website and blog for other items that she has recently posted. It is always fun to see what she creates as well as read about her rural life and community that inspires her work. Don't miss our other Common-Thread Artist's websites as well! We hope that you will enjoy our blogs and between all of us, we have a wide variation of art work and gift items for sale. Thank you again, and don't forget to register to win by going to Maria's website and simply leave a comment for her.